Penlac is the unique nail fungus treatment as it is a topical solution that is brushed over the nails. Penlac Nail Lacquer takes a different approach by directly treating the nail infection from the outside. 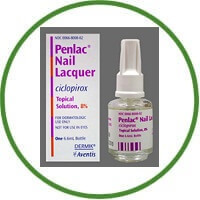 The active ingredient in Penlac Nail Lacquer is Ciclopirox. 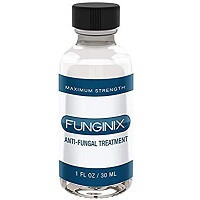 This is a powerful anti-fungal drug that is commonly prescribed by doctors for a variety of fungal infections. There are lotions, creams, and shampoos available with this primary ingredient. Penlac is a bit unique, because it is a topical solution that is brushed over the nails. Think of it as medicated, clear fingernail polish! Since it is used for medical treatment rather than beauty, it is just as suitable for men as women. It brushes on clear and is not easily seen by others. Using the solution is very simple. You brush the nails with the formula and allow it to dry. There is nothing more to it, other than waiting for it to start taking effect. The solution is designed to cure mild cases of nail infection, but may be effective with moderate cases as well. Some have found it to be effective with more severe cases of fungal infection, but more extensive treatments may be needed by some. Many competing nail fungus treatments are ingested. They treat the entire body, hoping to cure the fungal infection from the inside out. Penlac Nail Lacquer takes a different approach by directly treating the nail infection from the outside. This can bring faster results than waiting for the medication to work its way through the body and start focusing on the nail infection. While this is one of the more effective treatments for nail fungus on the market right now, there are some advantages and disadvantages to weigh before deciding if it is the best treatment for you. Not all treatments for this type of problem are approved by the Federal Drug Administration, or FDA. This is one of the biggest endorsements for using Penlac over the competitors. It is also much easier to use than others on the market and is one of the most effective topical treatments. It is even recommended by many doctors…which is a good thing, since the medication is prescription only! These negative should not be enough to sway most people from giving Penlac Nail Lacquer a try. Many medications are dangerous when the eyes, mouth or nose are exposed. This is a topical medication, and is not intended to be ingested or absorbed into the body. Directions for treating mouth, nose or eye exposure are on the package; just as with most other topical medications. Those with diabetes or autoimmune disorders may be unable to take this medication, or may be required to take a lower dosage than most others would take. Other than that, most people with mild to moderate nail infections will be cleared to take Penlac Nail Lacquer. Not known to come with dangerous side effects as long as it is used as prescribed for the nails and skin surrounding the nails. It is considered safe for pregnant women, but the dosage may need to be adjusted for those with certain medical conditions. The formula may irritate the eyes and is not intended for ingestion. Make sure it is used on the nail and surrounding skin only, unless told otherwise by a doctor. Bottom Line: Is It Right For You? If you are able to see your doctor and obtain a prescription medication, you should go in and discuss this drug as well as other options. Since this Nail Lacquer is only offered through prescription, it is not something you can pick up while you buy salad at the grocery store. If you do not have a medical treatment that makes I too dangerous to try this topical treatment, you are likely to be cleared for its use. After purchasing your prescription you will start applying it directly onto the nail as prescribed by your doctor. Your doctor can tell you about how long it may take to start seeing results. If you have a severe infection, it is not likely to be cured by the use of Penlac Nail Lacquer. You may be prescribed Penlac to use in combination with other treatments, or your doctor may prescribe another medication that is more likely to work with a more severe infection. This is the advantage to working with a doctor to treat you nail infection. You always have a professional opinion telling you what may or may not work for your condition. Keep in mind that it is effective and is FDA approved. This should give you some confidence that it has worked for others, and can very well work for you as well.